Use a soft and fluffy makeup brush to avoid irritating any sensitive razor burns. Every man has been there -- you can’t go to work with sloppy stubble, but rushed shaving and dull razors are certain to give you a bad case of razor burn. Although razor burn and bumps may be difficult to avoid at times, you can take comfort in knowing that such unattractive blemishes can be hidden in just a few minutes with ordinary cosmetic products. Well-groomed men have finally had enough; no longer will they helplessly submit to the public shame of razor burn -- it's time to wear makeup like a man. Select a green stick or powder concealer -- green is the natural color complement to red and the two colors neutralize one another when combined. Use a dark-green concealer if your skin tone is dark or tan. Pick a lighter shade of green if you have fair skin. Also choose a flesh-toned concealer that matches the natural coloration of your skin. Gently massage a dime-sized amount of moisturizer into the razor-burned area with your fingertips and allow it to dry for five to ten minutes before applying the concealers. Lightly coat the razor burn with a green stick or green powder concealer to counteract the visibility of red inflammation. Gently tap around the edges of the green concealer with either your pinky or ring finger to blend it with your natural skin tone. Squeeze two or three drops of flesh-toned cream-based concealer onto the back of your hand. Pick up some of the concealer with a fluffy makeup brush and apply with soft, circular motions to the razor burn. Blend around the edges of the concealer with the brush to ensure that it is well blended with your natural skin tone. Continue to apply the flesh-toned concealer to the razor burn with a makeup brush until the affected areas are completely masked. Inspect the application site under strong lighting to ensure that the edges are blended and that the concealer does not obviously contrast with the natural color of your skin. Coat a clean makeup brush or a latex sponge with translucent powder. Apply the powder with even downward strokes to all of the areas where you have applied the cream concealer -- translucent powder will prevent the concealer from being moved by the secretion of natural skin oils and sweat. Inspect the final result under strong lighting and reapply concealers and powder as necessary. 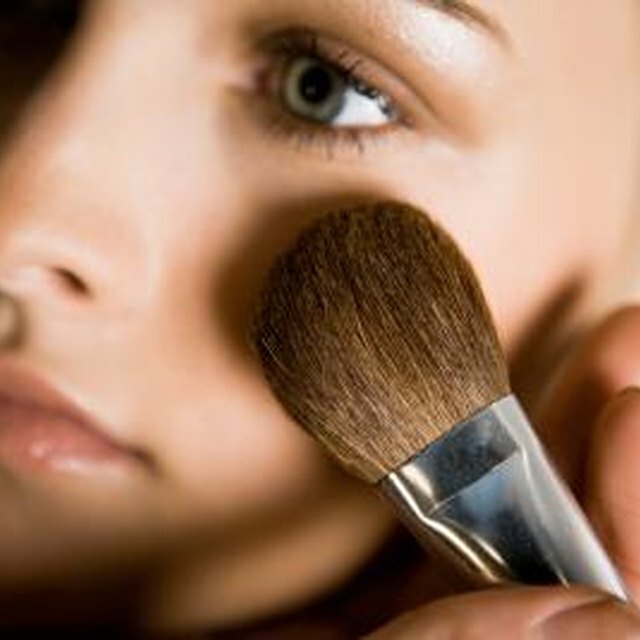 Always be sure to use clean makeup brushes and sponges to avoid the transfer of bacteria and dirt to your skin. If you experience further irritation and inflammation, remove the makeup and contact a dermatologist.